Finding just the right gift for a significant other sometimes means relying on hints; this is especially true if you are a bird and your significant other is also a bird. Even the cleverest corvids aren't great with wish lists. Male Eurasian jays, though, seem to be able to deduce which treats their mates want most. Sharing food is an important courtship ritual for the Eurasian jay (Garrulus glandarius). Passing snacks to each other helps the birds form, and nourish, long-term relationships. A female might accept any tidbit her partner gives her, whether she wants it or not, for the sake of boosting the bond—or just because she plans on stashing it for later. If a male can correctly guess what foods his mate prefers, though, he could increase his value in her beady eyes. Figuring out what's in another animal's mind is no mean feat. Yet Eurasian jays are a member of the famously bright corvid family; relatives have been known to reenact Aesop's fables, outsmart small children, and sled down snow-covered roofs. Nicola Clayton and other researchers at the University of Cambridge looked for evidence that these birds are also capable of seeing from another's perspective. The experiment relied on "specific satiety," which is when an animal gets tired of one kind of food but still has an appetite for a different food. This phenomenon is familiar to anyone who pushes away a plate of pasta, feeling stuffed, and then considers a dessert menu. For the seven pairs of Eurasian jays in the study, the foods in question weren't pasta and tiramisu but worms and more worms. Specifically, wax moth larvae and mealworm larvae. When they were first fed on one kind of larva and then offered a choice between two bowls, both male and female birds preferred to eat the kind of larva they hadn't already had. To see whether male jays understood that females felt this way too, the researchers fed female jays either wax moth or mealworm larvae while their male partners watched from the other side of a screen. Then they offered the male both kinds of larva, and let him choose which ones to pick up and pass to his mate through the screen. After watching their mates eat one kind of larva, male jays were more likely to feed them the other kind, Clayton reports in PNAS. It wasn't because the males themselves were hungry for that kind of food; the researchers checked this in a separate experiment by offering the males their own bowls of larvae after watching females feed. Having already eaten meals of "soaked dog biscuits, cheese, seeds, nuts and fruit," the males had their own preferences about wax moths versus mealworms (two flavors you won't find in a Whitman's sampler). But when feeding their mate, they followed her preference instead. Nor were the females telling their mates what they wanted, in some secret bird language, right there at the screen. The researchers know this because when males couldn't see the first feeding, they failed to give their mates their preferred larvae. The males had to see females being fed to guess what they'd want later. The study used a small number of birds in unnatural circumstances. If Eurasian jays can truly put themselves in each other's shoes, though, they are members of the cognitive elite. Deducing another's intentions or desires is something we humans rarely admit other animals are capable of. But then, it can be hard to take a hint. 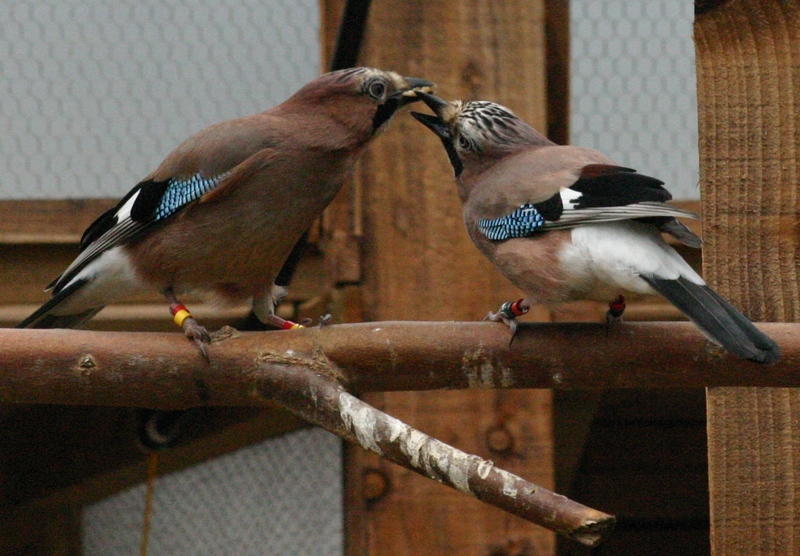 Image: Eurasian Jay mating pair engaged in food-sharing, by Ljerka Ostojic.